LittleBigPlanet 2 BETA Details Are Finally Announced! We've got some pretty exciting news for you! We need some help testing out LittleBigPlanet 2, and we have selected some of you to come along and join in the fun. If you have been selected, for a few weeks you'll be able to Play, Create and Share yourself silly in our greatest handmade adventure to date – all before anyone else sees it! How do I know if I have been selected for this beta? If you don’t want to join in, you can ignore the invite. If you do want to join in, the invite will contain all the information you need to get started as well as the Beta Trial Terms and Conditions. To take part in the beta you must be 18 years old or over and be a resident in a country in which we operate a PlayStation®Store. See http://eu.playstation.com for full details. You will also need a PlayStation®3 or PlayStation®Portable (PSP) with a broadband internet connection and a PlayStation®Network master account. The beta will be conducted in English only so you need to be able to provide your feedback in English. 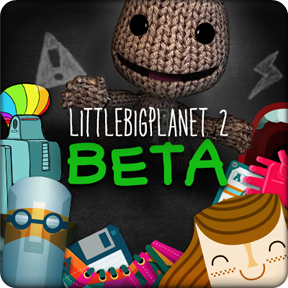 Our current Beta Test Community and our existing LittleBigPlanet beta testers will automatically be included in this beta trial. Please note that being selected for this beta trial does not give you access to other beta trials we may operate. Participation in our beta trials is subject to our Beta Trial. By accepting our invitation to join, you will be accepting the terms of this agreement so please read it carefully. These will be included in the invitation e-mails. What if I’m not chosen? So stay tuned and remember to check your inbox. 1. Log into the PlayStation Network. 2. Under "Playstation Network", select "Account Management". 5. On the next screen, check both boxes. 7. You will have completed the update, so simply Select "Okay" now.